ATARI FLASHBACK CLASSICS VOL. MY OPINION EXCELLENT / LIKE NEW. The object for sale is ONE item (unless otherwise indicated). Hello everyone! SPECIAL PRICE ! ATARI FLASHBACK CLASSICS VOL. NEW FACTORY SEALED. FACTORY SEALED! The object for sale is ONE item (unless otherwise indicated). (SPECIAL PRICE). Hello everyone! ATARI FLASHBACK CLASSICS VOL 2...XBOX ONE...***SEALED***BRAND NEW***!!!!! 5 out of 5 stars - ATARI FLASHBACK CLASSICS VOL 2...XBOX ONE...***SEALED***BRAND NEW***!!!!! 7 product ratings7 product ratings - ATARI FLASHBACK CLASSICS VOL 2...XBOX ONE...***SEALED***BRAND NEW***!!!!! Removed from cellophane, but never played. 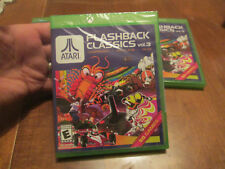 Atari Flashback Classics 1 & 2. NEW FACTORY SEALED. FACTORY SEALED! (SPECIAL PRICE). The object for sale is ONE item (unless otherwise indicated). SPECIAL PRICE ! Atari Flashback Classics Vol. 2 (Microsoft Xbox One, 2016) Factory Sealed NEW. Condition is Brand New. Shipped with USPS Media Mail. Atari Flashback Classics Vol. 2 Xbox One *New! *Factory Sealed! *Free Shipping! 5 out of 5 stars - Atari Flashback Classics Vol. 2 Xbox One *New! *Factory Sealed! *Free Shipping! 7 product ratings7 product ratings - Atari Flashback Classics Vol. 2 Xbox One *New! *Factory Sealed! *Free Shipping! New & Sealed! Atari Flashback Classics Vol. 2 (Microsoft Xbox One, 2016) Game! New & Sealed! Atari Flashback Classics Vol. 2 (Microsoft Xbox One, 2016) Game!. Condition is Brand New. Shipped with USPS First Class Package. 5 out of 5 stars - New & Sealed! Atari Flashback Classics Vol. 2 (Microsoft Xbox One, 2016) Game! 7 product ratings7 product ratings - New & Sealed! Atari Flashback Classics Vol. 2 (Microsoft Xbox One, 2016) Game! 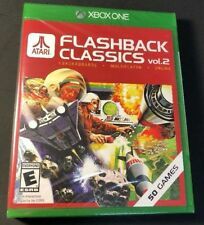 Atari Flashback Classics Volume 2 for Xbox One - Brand New Factory Sealed !! 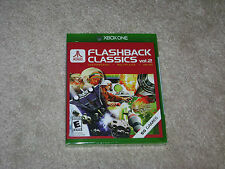 5 out of 5 stars - Atari Flashback Classics Volume 2 for Xbox One - Brand New Factory Sealed !! 7 product ratings7 product ratings - Atari Flashback Classics Volume 2 for Xbox One - Brand New Factory Sealed !! 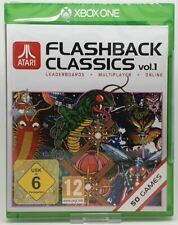 Atari Flashback Classics Volume 1 Xbox One Game Free Postage! 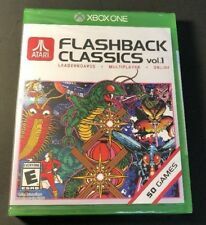 Atari Flashback Classics Collection Vol.1 (Xbox One) (New). 50 classic Atari and arcade titles remastered and bundled on one disc for the Xbox One. USED BUT IN GOOD CONDITION, WITH MANUAL. The Atari Classics Collection Vol.2 for Xbox One features 50 gloriously remastered (in stunning HD) classic Atari and Arcade titles. 50 classic and legendary Atari and arcade titles remastered beautifully and bundled on one disc for Xbox One. Atari Flashback Classics Collection Vol.2 (Xbox One) (New). 50 classic Atari and arcade titles remastered and bundled on one disc for the Xbox One. Atari video cube (2600). Marke Atari. Video Pinball (2600). Plattform Microsoft Xbox One. Add to collection. Race (2600). Products that may be of interest to you. How to Buy. ATARI FLASHBACK CLASSICS VOL. 2 for XBOX ONE new xboxone. Titolo videogioco ATARI FLASHBACK CLASSICS VOL. 2 per XBOX ONE nuovo xboxone. Piattaforma Xbox One. Please read before purchasing the article "Atari Flashback classics vol. "1 XBOX one" the full description of the article, to learn more about State & delivery and to avoid Fehlkäufe!. ATARI FLASHBACK CLASSICS VOL. 1 for XBOX ONE new xboxone. Titolo videogioco ATARI FLASHBACK CLASSICS VOL. 1 per XBOX ONE nuovo xboxone. Piattaforma Xbox One. Xbox One Atari Flashback Classics vol. Atari Flashback classics vol. Platform: Xbox One. Plattform Microsoft Xbox One. Regionalcode PAL. Format PAL (UK Standard). USK-Einstufung USK ab 6. Do not miss anymore! Please read before purchasing the article "Atari Flashback classics vol. "2 XBOX one" the full description of the article, to learn more about State & delivery and to avoid Fehlkäufe!.